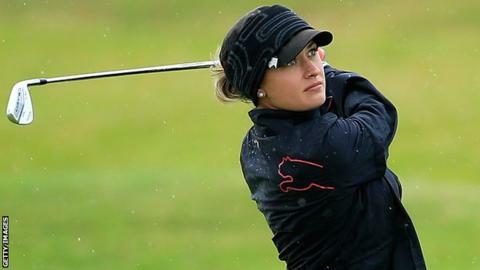 Welsh golfer Amy Boulden says her tied ninth finish at the Women's British Open proves she can compete with the world's best players. Boulden, 22, fired a final-round one-under 71 to end on four under par at Turnberry to record her best finish in a major tournament. Inbee Park won on 12 under, three clear of fellow South Korean Ko Jin-young. "This is my best British Open finish and I've loved being here," said Boulden. "It was another pretty solid round. Nothing really dropped for me on the back nine, but I gave myself a lot of chances so I'm very happy with the way I've played. "I think it's been great playing with Ryu So-yeon today and Lexi [Thompson] yesterday. It's great playing with these girls and seeing what I have to compete against." Boulden began her final round looking to build on the best-of-the-day 68 round she posted on Saturday and repeated her fast start on Sunday, pocketing a birdie on the third hole. A fine third shot on the par five came within a whisker of dropping for an eagle three, but Boulden happily tapped in to move to four under par. Like the slate-grey skies which hung over the Scottish coastline, the golfing gods were not shining on the Llandudno-based youngster as back-to-back bogeys on the fourth and fifth holes saw her slip back to two under par. But resilience has been key to Boulden's success at Turnberry, and she quickly bounced back from the temporary disappointment to produce the highlight of her final round. On the par-three sixth hole she sweetly struck a 195-yard tee shot to within a foot of the cup. There were chances to pick up more shots but she had to wait until the 14th to move to five under par. "I hit it quite close on 14 and I just missed my eagle putt which would have been nice to have gone in at that point," added Boulden. "I wouldn't say my putter was cold on the back nine as I was rolling it well, but it just wasn't dropping." As well boosting her ranking, Boulden's ninth-placed finish saw her claim £43,000 in prize money. The result is her second top-10 finish in as many weeks following her tied eighth result in the Scottish Open before arriving at the Ailsa Course. Rounds of 71, 74, 68 and 71 also saw her jointly placed as the best British player with England's Melissa Reid. "It's been a good couple of weeks," said Boulden. "They've been on links courses in tough weather which does suit me so I'll look to build on this for the season."